This is a filling yet fresh and light soup I made spur of the moment after our eating marathon Thanksgiving weekend. I mean, after Thanksgiving food, a huge family Friday night meal complete with more fish, more turkey, potatoes, mac and cheese with squash, pies (SO many pies), cookies (countless kinds)…to say I was full is an understatement. Then, after driving home from Kal’s Cabin, we unpacked leftover food and clothing. I was really too tired to go to the grocery store on Sunday and imagined it would be packed with people just like me who needed to get stocked up for the next week. So instead, I did a quick search in my cupboards and freezer and files and resurrected this soup recipe from The New York Times. To spice things up a bit, I added some leftover fresh frozen green beans, small ditalini pasta, and a few potatoes and a squeeze of lime juice. I had every single item needed in my cupboards, fridge, and freezer! NO GROCERY STORE SHOPPING WAS NEEDED! The result was a filling but fresh tasting soup. 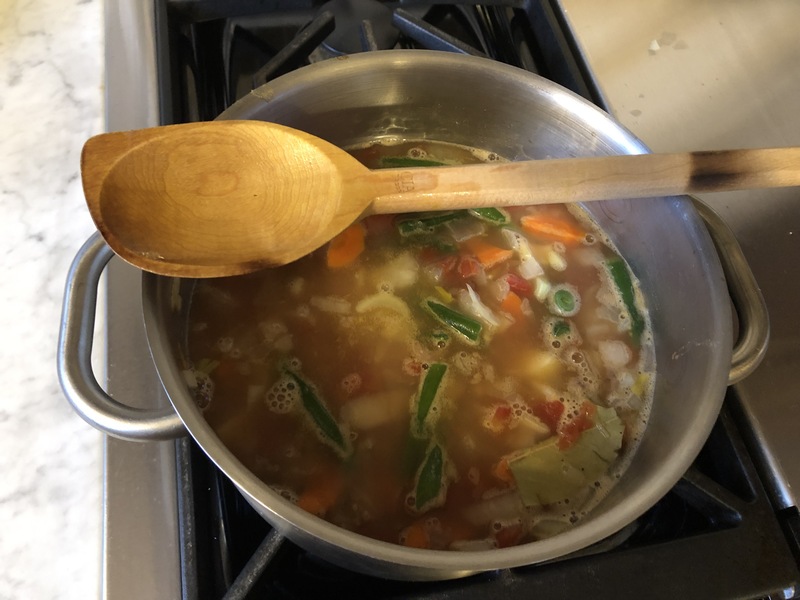 I liked it enough that I made it again mid-week because I had freshly cooked pinto beans and wanted to see how that would work It turned out the broth I saved from cooking the beans made even better soup stock. Heat oil in a large, heavy-bottomed saucepan over medium heat. Add onions, carrots, and celery, and sauté until barely tender, about 5 minutes. Add beans and garlic and stir for 2 minutes. Stir in tomatoes and their juices, and vegetable stock. Simmer for 20 minutes. Add quinoa, parsley, frozen or fresh green beans, any other herbs you love, and bay leaf. Cover and simmer until quinoa is cooked, 12 to 15 minutes. When 9 minutes remain of your cooking time, add the dry ditalini or orzo. Season with salt and pepper to taste. Remove bay leaves, taste and add the lime juice if you want to brighten the flavor and serve. The stew gets much thicker if you make it the day before, which I like better. Serve with a simple butter lettuce salad and some rustic, grainy bread and you have yourself a meal! If you don’t want such a thick soup, boil the ditalini pasta separately and add it right before reheating. You could also substitute cooked brown rice for the cooked pasta. 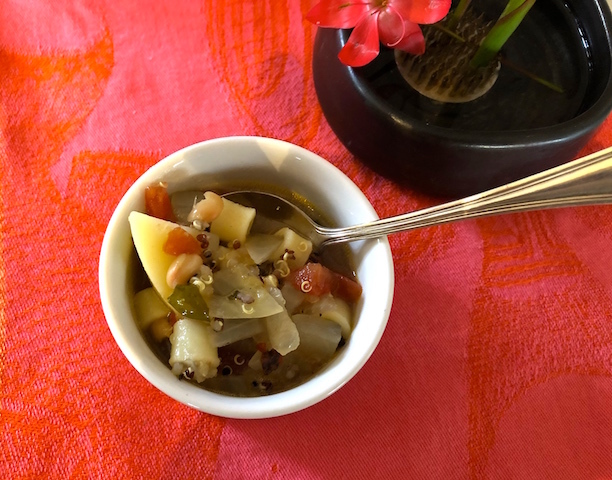 This entry was posted in Soups and tagged Kitchen sink vegetable quinoa bean stew. Bookmark the permalink. With temperatures in the -20s, I’m not going out unless I have to, so a “clean out the pantry, or fridge” recipe is great. Sometimes I substitute with what I have on hand, and I like it even more! Soups are great in this weather! Oh boy, stay warm and do not go out!! You can substitute so many things here as you know. I just made it with some brown rice becaus I ran out of quinoa, and some different beans too. SOup is so good with these dipping temperatures. Hope you get some warmer weather soon.